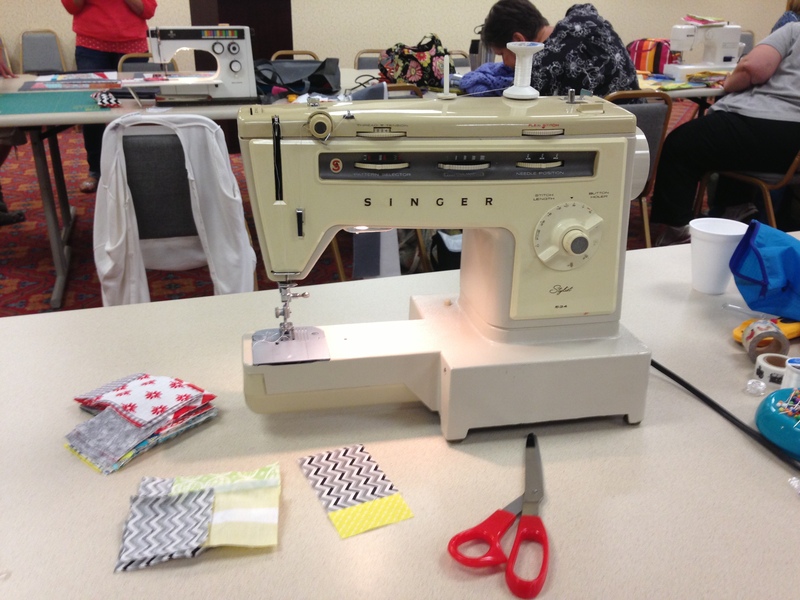 I attended my first-ever quilting event that involved talking with other quilters: the Crystal Lake Modern Quilt Guild monthly meeting and sew-in. Unfortunately, I missed the show-and-tell portion. (I was late for a variety of reasons. I HATE being late for anything.) I had most been looking forward to that part of the meeting, but it was at least fun to look around the room and see what kinds of projects others were working on. The prospect of talking with other people about quilting scared me. I only know what I have found on the internet, and some of my methods are “non-traditional.” In other words, I anticipated more judgment for some reason. I am far less secure with my creative abilities than my professional abilities. I needn’t have worried; everyone I talked to was nice. I received only kind comments about my Marcelle Medallion, which was the project I brought to the meeting. Since the quilt pattern is all over the internet, I was surprised not everyone knew about it already. I was happy that I could share useful information with quilters who are more experienced than I am. I finished the piecing for my first “extra” border to convert the quilt to full-size but didn’t quite have time to sew the border to the quilt top. Instead, I took a small break this week to make my dad a gift for Father’s Day. The hoop is tiny, just 3″! 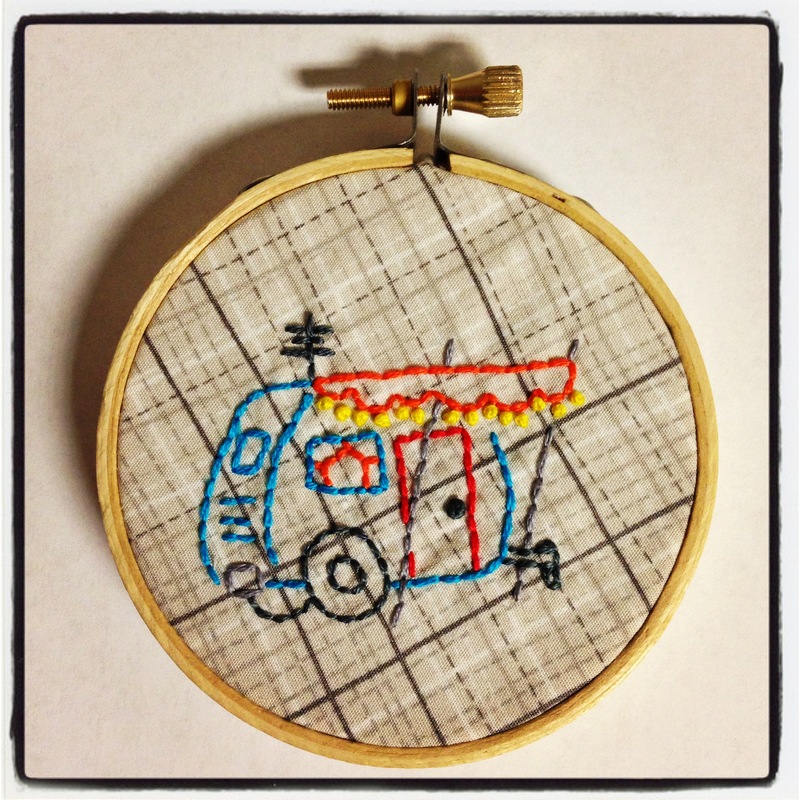 The pattern is Sublime Stitching’s Camp Out. What are you doing for Father’s Day? Does your family have any traditions? I had a hard time thinking of what to make or do, as I do every year. I thought a fun project another time would be to make a Dresden plate pillow out of all the ugly ties we gave my dad when we were kids. How many M&Ms ties can one man wear?! Categories: Embroidery | Tags: camp out, camper, camper embroidery, camping out, chicago modern quilt guild, crystal lake, crystal lake modern quilt guild, embroidery, embroidery hoop, farming, father's day, glamping, hoop art, hoopart, marcelle medallion, modern quilt guild, patchwork, piecing, prairie, public, quilting, self-taught, self-taught sewer, self-taught sewist, sewing, show and tell, small embroidery hoop, south dakota, sublime stitching, teaching yourself to sew, ties | Permalink.